Bloody hell, a quick fixture reversal and we are off to Bedworth this Saturday, so an equally quick short and sweet, but hopefully informative PRATS blog. With Latimer Park likely to be hosting the bog snorkelling championships again this weekend its excellent forward thinking by the clubs to sort this out so quickly. Which means instead of sitting at home skulking about whilst Mrs Fuggles does the hoovering, we can now enjoy a decent day out watching footy and guzzling a few ales down. It’s just a short trip to Bedworth, no more than an hour from God’s chosen town. There are quite a few excellent micro-breweries in the area, all with tap rooms for us to sample their wares. So the first port of call has to be the Church End Brewery,always a good selection of their delightful brews available. 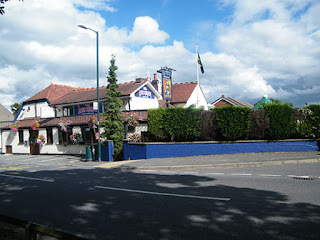 The Poppies Travel club used to frequent this delightful brewery-boozer on previous trips to Nuneaton. Then just a couple of miles away is The Lord Nelson Inn at Ansley home of the Sperrin Brewery we had a couple of their ales at the last Poppies beer festival. They usually have 6 or 7 hand-pumps with at least 4 of their own ales on tap, plus a couple of guest ales. They also sell Chadwick’s pork pies, lovely. With a bit of luck the Chadwick’s will be open as we make our way to the Oval, home of the Greenbacks. Then when the game is over, we can make our way to the Wood Farm Brewery no more than 15 minutes away. We’ve been here before on several occasions. Hopefully, they’ll have at least 8 of their own ales available. They also sell a decent pork pie. Sounds like we’ll have a good day out, if we get home soon enough we’ll have time to pop into The Alex to wrap the day up nicely.